The weekends in April and May are filling up fast with family events, but I was able to find some time for quilting. Last weekend the machine quilting on Ruby in the Sky – a quilt top made in 2011 – was completed and the binding sewn on. 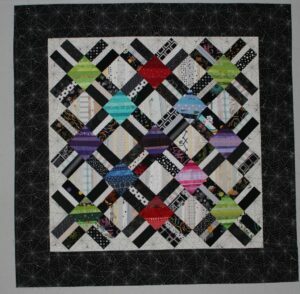 All that is left is the handwork and I am hoping for a Friday finish for this quilt. 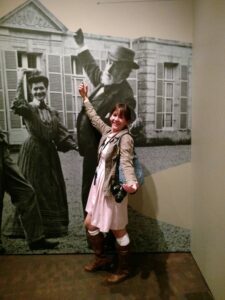 On April 15th I went to the Degas exhibit at the Denver Art Museum along with my brother and middle daughter. What a great experience! On display were numerous sketches & sculptures before showing his final painting. 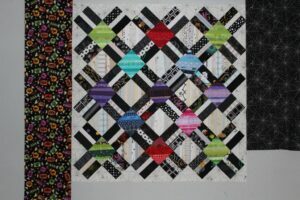 It inspires me to continue to stretch myself as a quilter. I also tackled the issues with the Double Wedding Ring – namely no fabric or template for the cornerstones. A partial solution involved a trip to the quilt store since there is no 30s fabric in my stash. That isn’t a style of fabric that appeals to me and it was very difficult to make a decision. I really should have known better, but I only bought one piece of fabric for the cornerstones. Once I was home however, I realized that I should have bought two. There was a piece of darker gray lavender in my stash, so I started cutting into that. But after getting a few of the melon shapes together it is very evident that this will not work. After work on Monday I stopped at the quilt store – again – and came home with a pink 30s print to use for the other cornerstone. Doesn’t that look a lot better? The rings are not sewn together yet – the parts are just lying on the floor so that I could get an idea of size. It may be hard to see in the picture, but from outside edge to outside edge it measures 26″. The wedges in the arc are 3 1/2″ tall which seem larger than usual. 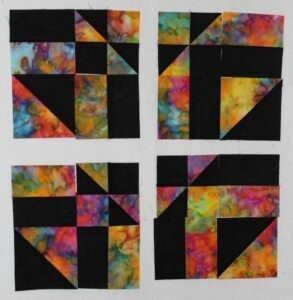 I have decided on a 3 x 3 layout which I am hoping will be in the 65 – 70″ square range. I am making all the melon shapes first and then will sew all the units together. Next up will be putting a round peg in a square box. I am not a big fan of scallops, so I want to do something different. 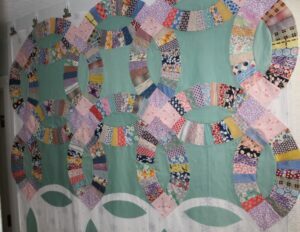 Some of the DWR quilts that I have seen with straight sides are appliqued on a wide border – I don’t want to do applique. 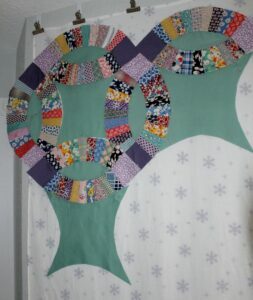 So what I plan to do is make a border template using the middle background piece to fill in the gap between the rings and give the quilt straight edges. I will let you know how that goes. 1. This is a great way for me to learn how to assemble a DWR quilt without the pressure of fabric that I absolutely love and with part of the piecing already done. There has been a steep learning curve and I am sure that there will be more lessons in my future, but I wouldn’t hesitate to tackle another DWR. 2. I like the idea of Nettie’s UFO finally being finished. Of course I have enough of my own UFOs, but there is something gratifying about completing someone else’s. 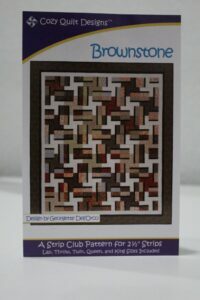 The Brownstone quilt top is finally completed. It took longer than anticipated to finish mostly due to not enough background fabric and the Easter weekend. I was short by 5″ x width of fabric for the first border. But with some helpers along, a substitute fabric was found. 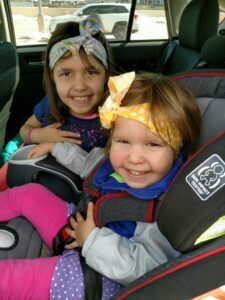 The friendly ladies at Holly’s Quilt Cabin let the girls each pick out a strip of fabric – the perfect length for hair bows. Don’t those smiles just brighten your day? Now back to fabric choices. If you look closely you can see that the border fabric is just a touch darker than the block background fabric, but it is not noticeable from farther away. 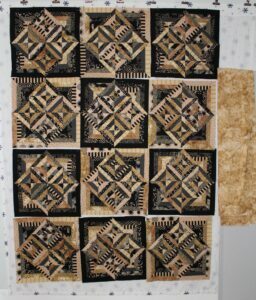 The second border is a striped brown from my stash that was also one of the strips in the jelly roll. 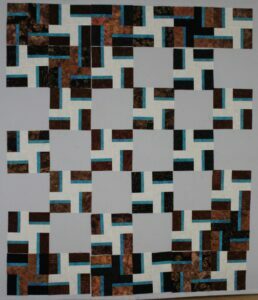 The accent strip and third border were sewn from 3 – 1 yard pieces of bright turquoise which I bought for a paper piecing project that didn’t happen. 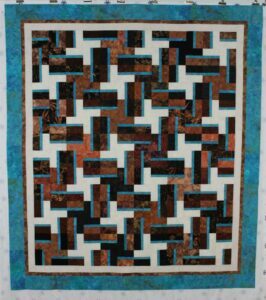 The turquoise really makes the quilt cheerful even though the center has so many browns & blacks. Right now I have 7 different projects on my design walls – which is a lot for me, so I had better get busy. 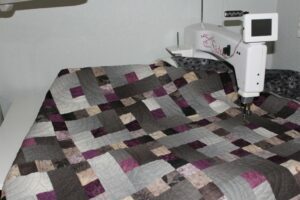 First up is finishing the machine quilting on Ruby in the Sky. This project has been sitting under the needle for at least 4 weeks, however I was able to work on it this morning. Hopefully the quilting will be finished by Tuesday so that the binding can go on Wednesday evening. My Bernina came home from the spa on Friday eager to finish the center of the Brownstone quilt. So that is what we did. 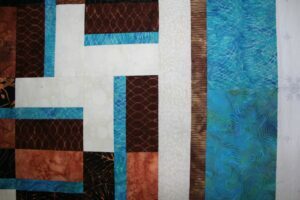 All that is left are the three borders – light tan, brown and turquoise. I am very happy with the turquoise accent and think that it will look even better with the borders attached. Libby’s Magical Mystery Blocks is winding down. Here are my two guesses in the “What block do you think these units make?” game. Tomorrow we shall see how well I did. By bedtime all the strip sets were pressed and cut into units. Since everything was ready, the blocks came together quickly. After all now it is only 3 seams to a finished block. All the block B’s are completed and 8 of block A. I know the layout on the design wall looks strange, but I have a method behind the madness. 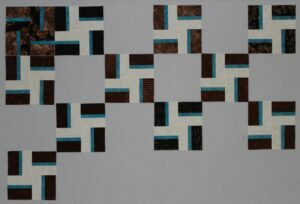 The block B’s were laid out alternating brown and black – as much as possible. Each width of fabric strip set makes two A blocks, one with one fabric as the inside pinwheel and the second with the other fabric as the inside pinwheel. 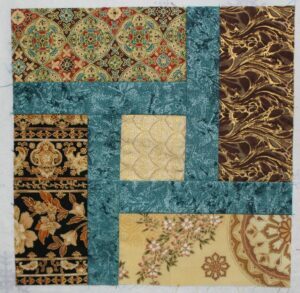 Because I didn’t want the same two fabrics next to each other, the first block with a black pinwheel was placed upper left and the second with a brown pinwheel on the bottom right. 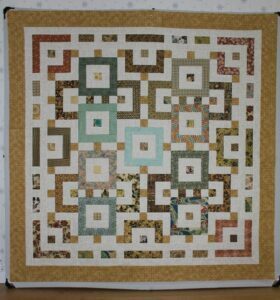 The next two A blocks were placed with the brown pinwheel top center and the black pinwheel on the bottom center. Now I will just alternate black & brown meeting in the middle of the quilt top. Since the size I am making calls for 21 A blocks, the singleton block will be right in the center. The turquoise accent is quite striking, isn’t it? I hope that when the quilt top is completed, I don’t smack myself on the forehead and ask “What was I thinking using that bright turquoise?” This is the “second-guessing myself” stage of a quilt followed by “Will I ever get this finished” and “Borders take forever to put on”. But for now this project will have to wait until my sewing machine is back home. 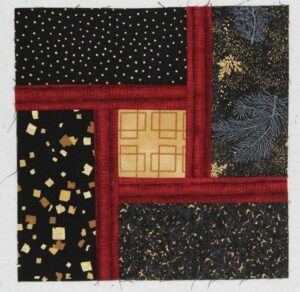 The plan is to finish the machine quilting of Ruby in the Sky and get it bound although I think that I will pull out my Featherweight for some piecing. Even with a play date with my youngest granddaughter, I still found time this weekend to finish sewing the rest of the Oriental Tiles blocks. The top row is sewn together and – hopefully – by Friday the rest of the rows. All that will be left is the sashing between the rows then the top & bottom sashing and it will be completed. but I am having fun with the block. 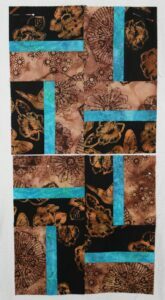 All that is left of the jelly roll is 31 – 2 1/2″ squares which I consider a win. 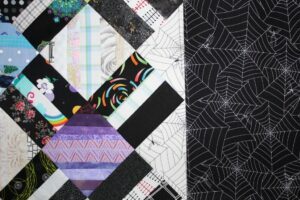 Libby at Life on the Hill is sponsoring a Magical Mystery Block quilt-along every Friday. I was running a bit behind, but got the fabric cut and the first clue sewn yesterday afternoon. I have no idea if the rail fences will be placed in this setting, but I liked the way they look. Thank you Libby for hosting this mystery. It would have been difficult to fit in a full quilt, but I can handle four blocks. The Oriental Fortune quilt top (70″ x 70″) is finished. 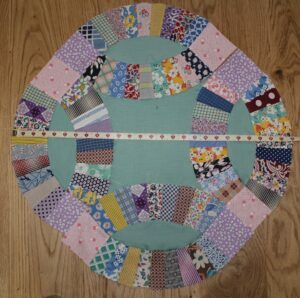 It is a good pattern to showcase a special jelly roll and I am very pleased with the final result. Of course, there was a pile of leftover strips that begged for a home. 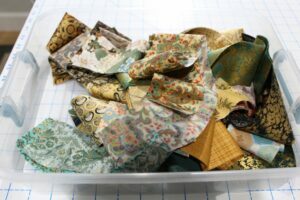 After looking through Kim Brackett’s books, I decided on the pattern Tiles in Scrap-Basket Strips and Squares. 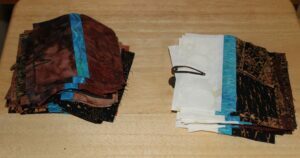 Since her strips were larger than 2 1/2″ I needed to resize the block so that it would work with the Oriental jelly roll strip. Once that was done, all that was left was to tame the pile and see exactly how many blocks it would yield. 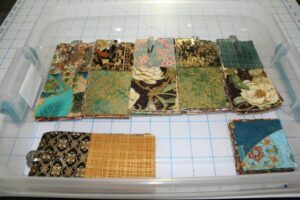 Everything cut, stacked and ready to make 30 blocks along with a pile of 2 1/2″ squares. After finding a dark turquoise in my stash, I needed to make a trial block, right? 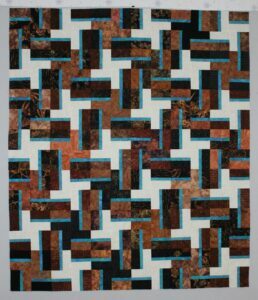 My block measures 8 1/2″ unfinished, so the quilt should end up around 46″ x 55″. What a fun little quilt this will be! PS After looking and thinking about this block overnight, I have decided to take it apart, trim the turquoise accent strip by 1/4″ and sew it back together. The accent strip feels too wide so it is going on a diet. Hopefully I will be happier with the end result. This last weekend was busy, but I did find time to squeeze in some sewing. First up, the Bouillabaisse quilt top is completed. 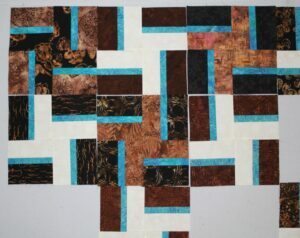 When there are only 12 blocks and each block measures 20″ square, the center of a quilt top goes together very quickly. At first I was wondering if the border (cut 6 1/2″) was too wide, but now that the top is finished I think that it looks good. 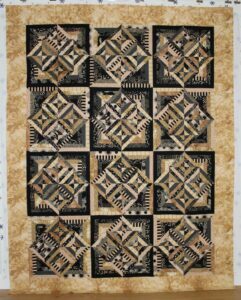 It finishes at 72″ x 92″ for a nice twin sized quilt. Maybe now I will work on some smaller projects – like a doll quilt. I had a visitor and sewing buddy on Saturday – Evelyn, one of my granddaughters. She wanted to sew a doll quilt, but was a bit surprised at all the math involved. After deciding on a finished size (18″ x 24″) and the size of the squares (3″ finished), we worked the math to figure out how many squares in a row, how many rows to make, and how many total squares needed for the quilt top. 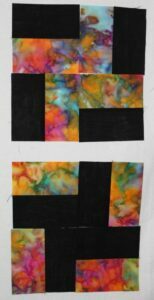 I had her work with paper and crayons on color placement & design for her quilt, then Evelyn picked the fabric from my 3 1/2″ strip bin for the squares. 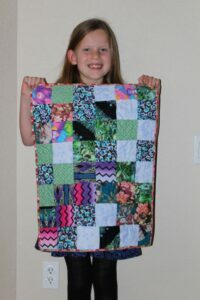 She did all the sewing for the doll quilt top, while I rotary cut the fabric, then machine quilted & bound the project. We were determined that she would have a finished quilt to take home with her and it happened. Doesn’t she look like she is already planning her next quilting project? 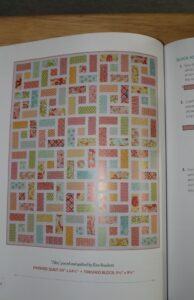 Maybe it will help me decide if I check out the quilting inspiration at Judy’s Design Wall Monday. It snowed all day Sunday so that automatically made it a sew-day. 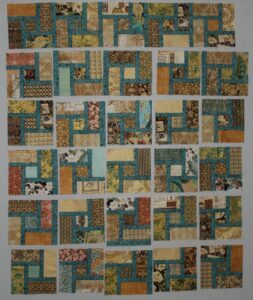 All twelve blocks for the Bouillabaisse quilt are finished – finally. It is so close to being completed. I just need to sew the blocks together and add the border. The fabric hanging on the right is the border. I want to get this done and off of the design wall because I am ready for a new project. One of my 2018 goals is to make another recycled shirt quilt, so last weekend I stopped by GoodWill to pick up some more shirts. I really lucked out because it was 50% off everything in the store day and nine shirts followed me home. I already have two Bonnie Hunter patterns picked out – Tumalo Trail from Scraps & Shirttails II (with a different border) and Swing Your Partner from Scraps & Shirttails (with a different layout). Both patterns call for 3 1/2″ unfinished HST, so that will be the first step. 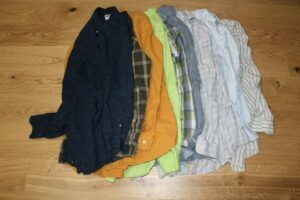 The recycled shirt quilts make great masculine quilts which I need for my grandsons.